Mother's Day is the day after tomorrow. Have you picked out the perfect gift? Are you scrambling for last minute gift ideas, like me? 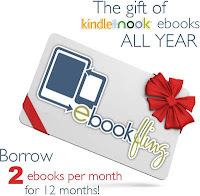 This is an in depth list that includes a variety of gifts for mom's of all ages. You can find something here for the hostess mom; gardening mom, trendy mom; hipster mom; grandmotherly mom; professional mom and every other mom. We only have one mom, so let's make this Sunday a special occasion for her. Let your mom know how much she means to you. Here is my list of favorite gifts, in no particular order. Prices vary from under five bucks to over two hundred. 1. I love this one and wouldn't mind (at all) hint...hint...hmm...hmm, if my hubbie helped my little darlings pick out a Zip up Smart phone wallet or clutch for mommy dearest. They are reasonably priced at under $50 and come in a variety of colors. 3. 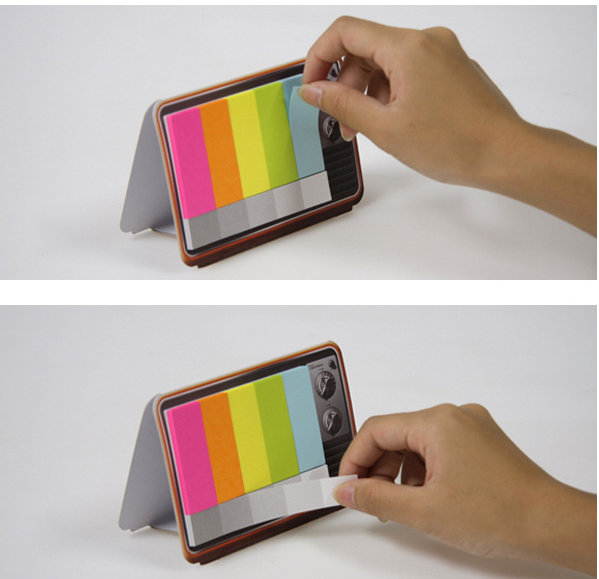 How about these adorable mini sticky notes. 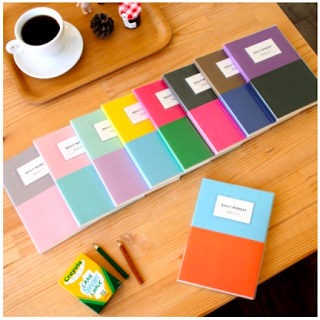 They are perfect for tabbing your manuscript (I mean for your mom to tab her reading), and they are less than 5 bucks. 4. If your mom is un-like me, and thrives on her organizational skills, check out these daily schedulers & planners, for under 20 bucks. 5. 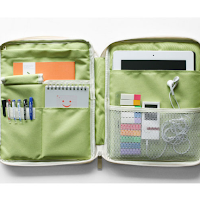 More for the organized mom. 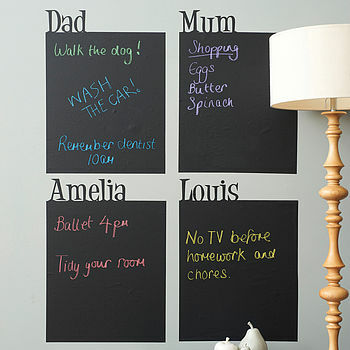 The custom name chalkboard wall sticker, for about 30 bucks. 6. Does your mom enjoy gardening? I do (I mean my mom does). 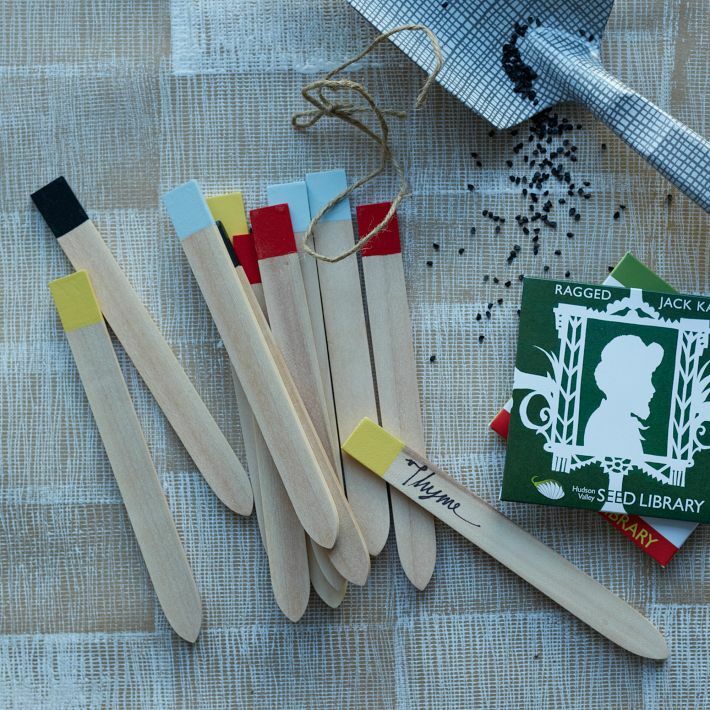 Pick up a set of these nifty dipped plant markers for only twelve ($12) dollars. 7. I stumbled upon quite a few conversation sparkers. 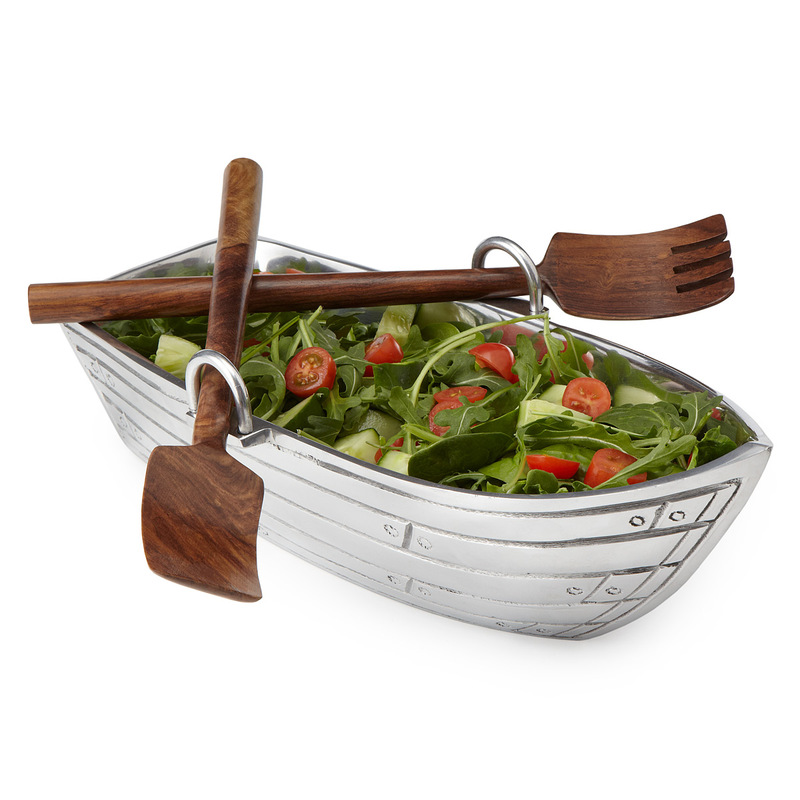 What guest wouldn't eat their greens, when the salad is served in this row boat salad bowl? 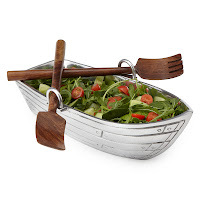 For just $6, it also comes with a set of wood serving utensils. If your mom is anything like my mom, she has picky eaters to cook for. "I don't want vegetables in my lasagna," or "I want extra cheese." And it never fails, my sister always has her healthy request...something like whole wheat pasta only. 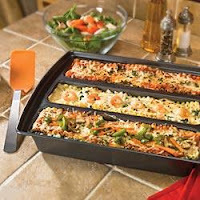 Problem solved, with the trio lasagna pan. Another bargain for under twenty bucks. 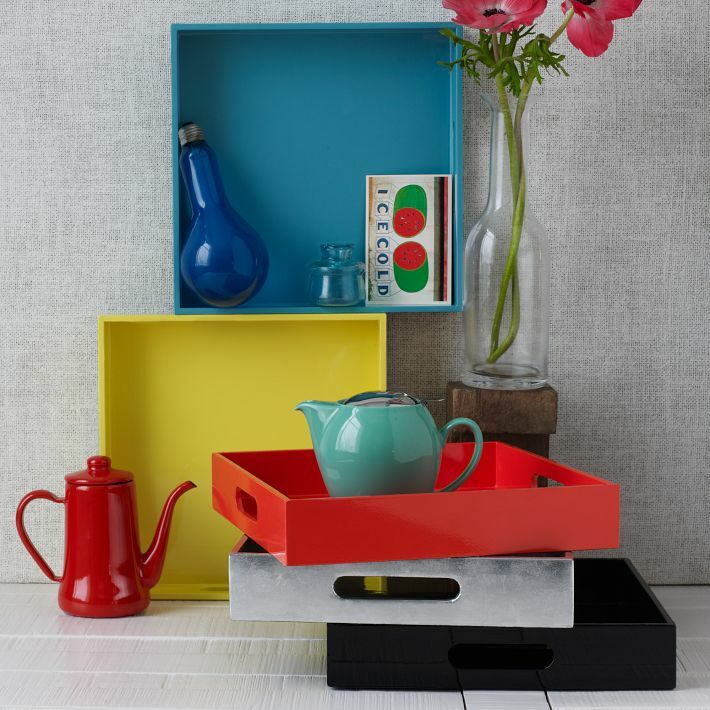 Don't you just love lacquer? My mom adores anything lacquered and I found these bright, cheery & colorful Square Lacquer Trays for under $25 dollars. If you have kids then your mom is also a grandmother & we all know how much granny loves to entertain our children. Kids can be messy & we wouldn't want to discourage their creativity. Now you don't have to. 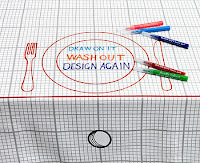 Just toss this doodle tablecloth on the table and the kids will entertain themselves throughout dinner and grandma will have an artwork masterpiece to show her friends, all for around sixty bucks. Have trouble keeping up with the number of guest you have? 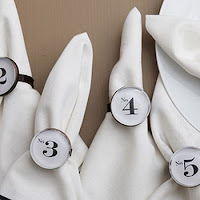 Me neither, (at least not until after a few cocktails), but just in case, why not use the trendy Ella James, Numerology Napkin Rings, What a bargain at under seventy dollars. Wine...Vino...Didn't I just say something about drinking wine? I must have, because now it's on my mind. What dinner would be complete without a glass of vino? You want to give mom a real conversation starter? Give her these funky wine glasses. 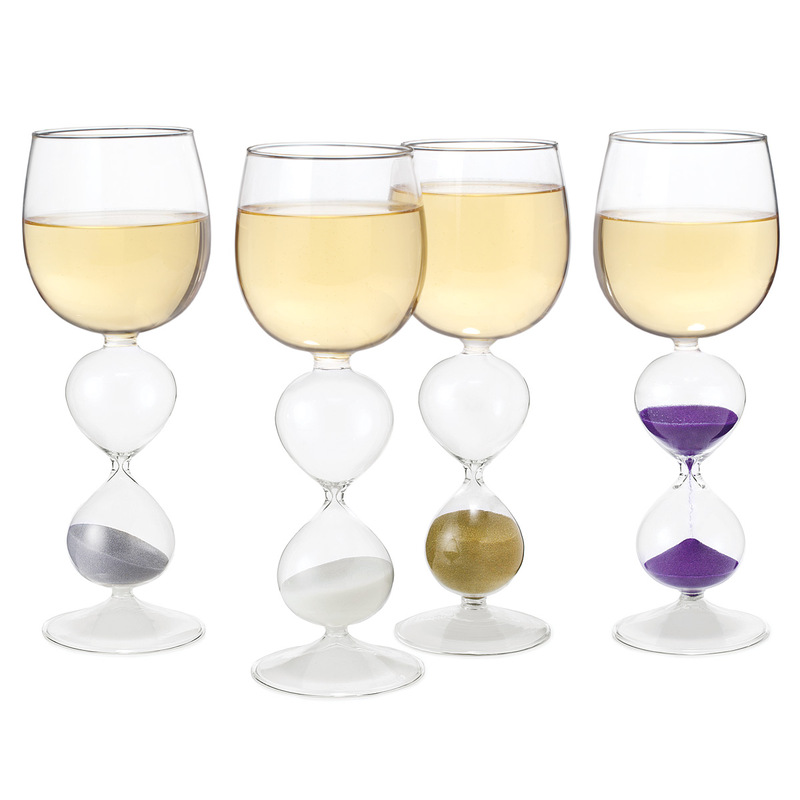 Now you can tell who guzzles their wine too quickly and who nurses just one glass. 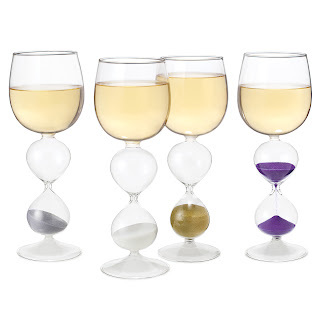 Try the fun, "sands of wine," WIne Hourglasses. 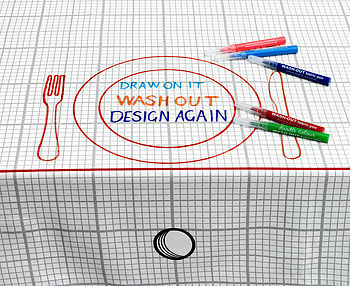 Just flip the glass to start its timer ~ and the table conversation. A set of four will set you back $75 dollars. But, these funky hourglasses aren't just for wine. 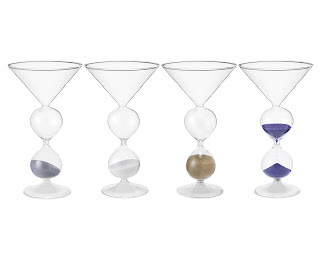 If mom prefers her cocktail shaken not stirred, then opt for the time honored Martini Hourglasses. Not so fast. I'm not quite finished sharing my wine related choices for mother's day. Now, I'm not a snob, so I'm not about to knock the wine in a box thing, but hey...if mom's gonna drink wine out of a box, I say let's jazz it up for her. Just like you, me or our mom, like to put on our fancy clothes when we go out on the town...well, we can dress up that box wine, too. This next item was something new to me. I saw it for the first time today, but fell in love with the creativity and sassiness of it. 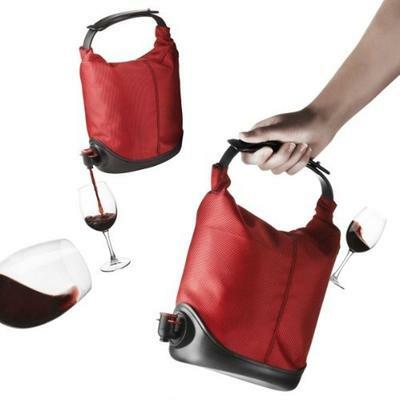 Next time mom wants to bring her box of wine to the family barbecue, both mom & wine can arrive in style. 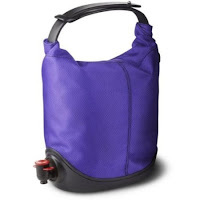 Give mom's box of wine a fashion makeover, dress her up in a baggy wine coat for $60-75 bucks and take her out to play. More gifts to help mom around the house. Every mom knows what its like to lose a sock in the dryer. 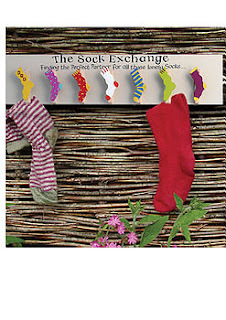 Make it easy for mom to pair them up with her very own Sock Exchange, for about thirty bucks. Don't you love hooks? I do. I'm like addicted to wall hooks...anything vertical, that gets the crap, kids junk, off the damn floor. 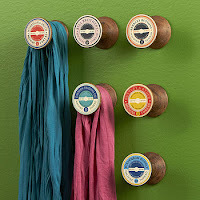 Check out these cotton reel wall hangers, stunning hangers for coats, scarves, hats etc., in the shape of a spool. 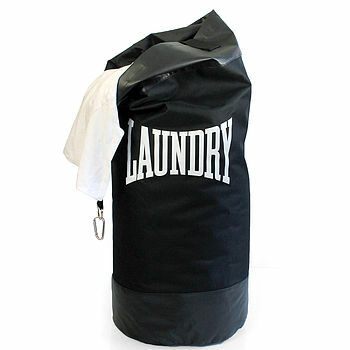 Does mom ever get stressed out & wish she had a punching bag? If not she can still use this gift to turn her laundry chores into a workout, for only forty dollars. Does your mom enjoy reading books? That was a stupid question. Of course she does...she's your mom. Does she need some awesome book ends to hold all of your published novels? These are seventy dollars. 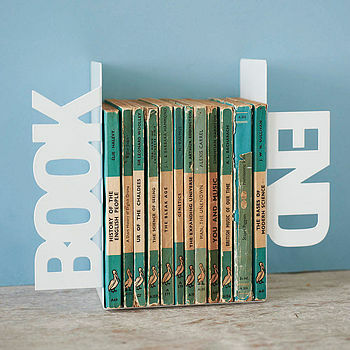 Don't you wish you could buy your mom a book every week or two? Me too, but it would be very expensive. What if mom could borrow two or more e-books per month, from Amazon or Barnes and Noble for her Kindle or Nook. Now she can for only $29. Let's hope she already has an e-reader...or a birthday coming up. 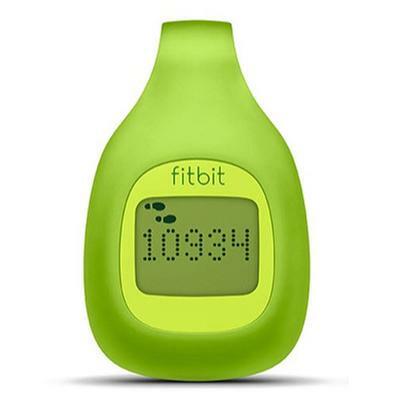 Why not start with a Fitbit Zip Wireless Activity Tracker. 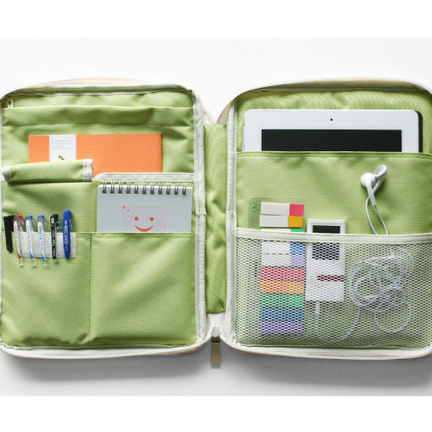 What a nifty & resourceful gadget for under fifty bucks. And she'll need some cute & comfy yoga pants, to look her best while power walking through the neighborhood. Victoria Secret has several colors and patterns, all for under thirty dollars. 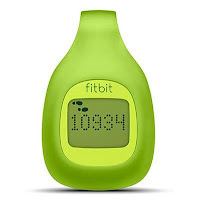 Or maybe mom would rather get fit, in her own home with a complete Zumba Kit, for around $75. So you want some ideas for the fashion savvy mom, you say. Well, you come to the right place. 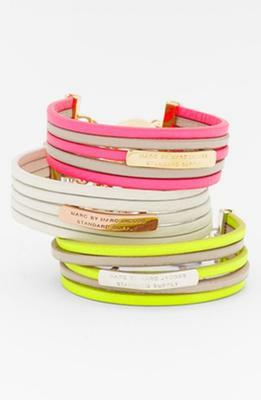 I bet your mom would love sporting her new Marc Jacobs, leather ID bracelet. She'll never know you bought it for less than a hundred dollars. Or maybe your mom is more into personalized and sentimental jewelry. 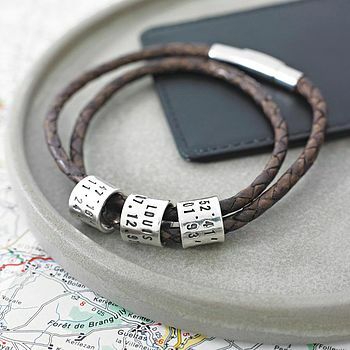 Then a personalized storyteller bracelet or necklace, is what you're looking for. You can get either one for a little over a hundred dollars. Does mom need an overnight bag? Maybe she lives out of town and you want her to visit, soon. Why not pack her in style. 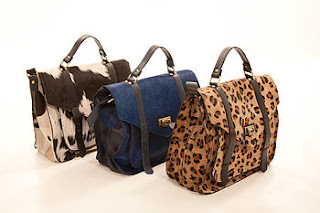 This one is a little pricey, but the two hundred dollar, day and night cow fur satchel is a knockout. Do you love the comfort of Toms shoes? Then you'll, (I mean your mom) will fall in love with Toms Strappy Canvas Wedges For around seventy dollars, mom will be styling. Our moms are the reason we are here and most of us owe our mother so much. 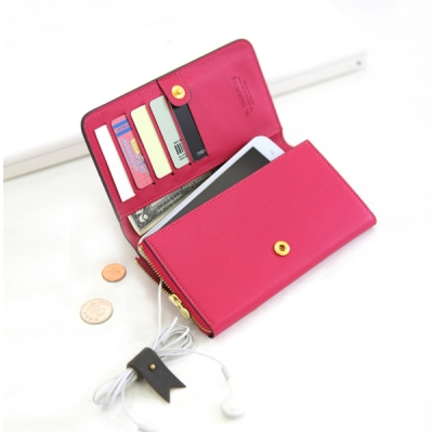 What a way to show mom your gratitude, pamper her in style. 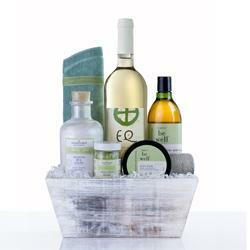 For under a hundred bucks you can treat mom to the luxury of unwinding at home with a wine/spa basket. Cloud 9 Living is available in most major cites and offers a host of packages and experiences including a special offer on the "treat mom to a day at the spa" package. Check out their site for other amazing adventures. 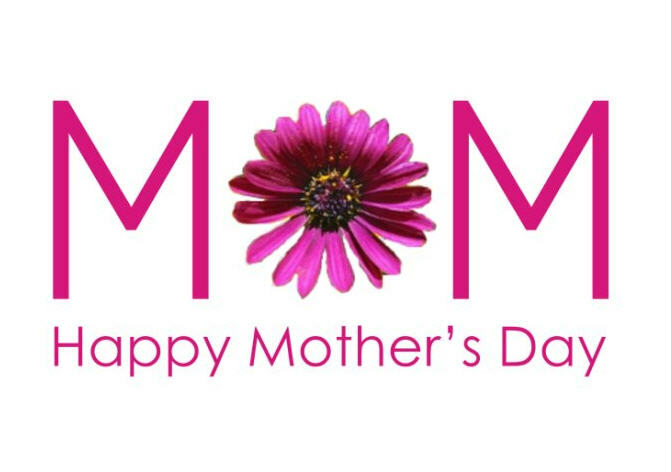 I had a few more gift experiences to share, but if I keep typing, Mother's day will be here and I will have not shopped. Happy Mother's day to all of you who are mothers, daughters, grandmothers, aunts, sisters, god-mothers, step-mothers and to all women who have someone in their lives who make them feel special. You don't have to be a biological mother to enjoy recognition on Mother's day. I am so grateful for my own mom and for my children who made me a mommy. Thanks, Melissa Sugar, for sharing this great stuff with us, these gifts are inexpensive mother's day gifts as well. Have you ever considered automating your free bitcoin collections by utilizing a BITCOIN FAUCET ROTATOR?